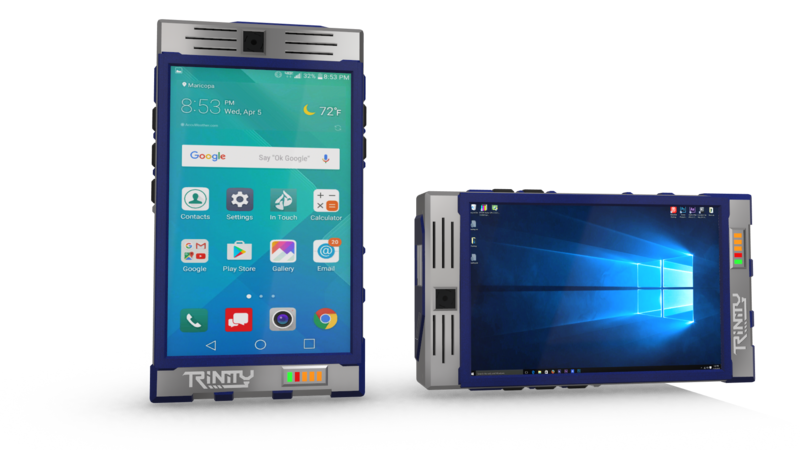 Trinity is a first of its kind smartphone to bridge the two systems in one device while not sacrificing any of the features that exist with either operating system. Trinity is essentially two computers sharing a 5-inch display, ports, and peripherals. The first system is an NXP quad core iMX-6 with 2GB of DDR2 Ram and boots a Droid OS on its own drive. The secondary system is an Intel Braswell Processor with 4GB of DDR3 Ram and a 128GB SSD for its OS storage and applications. The Intel system boots a full desktop/laptop version of Windows 10. The Trinity system is managed by a smart hardware controller to switch between the two different processor/OS systems on board. Its smart controller handles power management, putting unused peripherals and processor cores to sleep as well as merging ports and peripherals such as the on-board 4G LTE modem. Trinity (formerly Nitro Duo) is aimed at the smartphone user who still uses a desktop or laptop computer. In these cases the user must maintain both the smartphone and a traditional Windows based PC for their everyday life. Nitro is the first of its kind attempt to bridge the two systems in one device while not sacrificing any of the features that exist with either operating system. 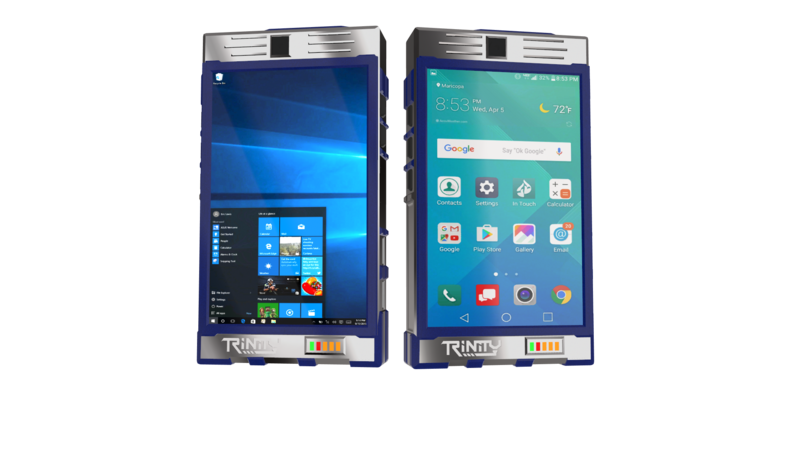 Trinity's Intel Braswell processor is fully compatible with traditional Windows desktop applications and yet at the same time operates in a fully Droid experience mode at a reduced power level when needed. Both systems can be run simultaneously or put one system to sleep when not in use and extend the battery life. Trinity will come with two USB ports, one of which will be USB 3.0. There are two HDMI ports switchable between operating systems as well as the USB 2.0 port.